I know most people started their training 3 or 4 weeks ago, and though I was running, I wasn't on a training plan yet. 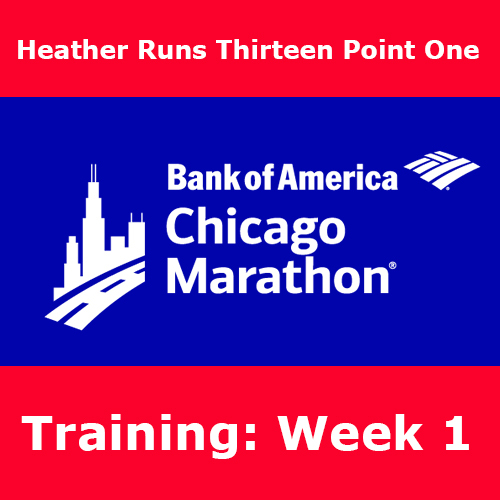 The one on Chicago Marathon's website was a bit too much for me, and lucky for me, I was able to get a coach from Sweat Tracker* to set up a training plan specifically for my goals and abilities, super personalized, to get me to the finish line. So, that's why that was week 1. I'll have another post soon with more details about Sweat Tracker and how it's going. During the holiday weekend, I decided I wanted to get back into Jillian Michaels videos to help lose weight, build a better core (and really, muscles everywhere), and just generally improve my overall athletic abilities. I have her 90-Day Body Revolution, so decided to start the program back up (I never finished it the first time around), however, running would be my main focus and priority. I managed to get Monday's workout in post-work, and then I woke up early Tuesday morning to fit in Phase 1 Workout 2 in the morning before heading to work. Unfortunately, I didn't manage the workouts on Thursday or Friday, as planned. On Wednesday I started to feel the beginnings of a cold coming on, so decided to focus on running and getting the rest needed to stay healthy before it became a full on illness (generally with me, it becomes a sinus infection, or something respiratory – neither of which I'd like to deal with). Through my many sicknesses throughout the year, I know that for me getting a bit of extra sleep is very helpful for me, so that's what happened. I felt pretty good after them – sore, but in that really good way. The way that you know your body is working on getting stronger. Hurts so good. As far as the ruling went, the 2 miles on Tuesday–Thursday felt really good. I was feeling tired on Thursday, but apparently my legs weren't, because I couldn't slow them down to my a pace I felt I should be at, and I finished my two miles with a 30 second faster average pace than usual. Who knows what was going on. On Saturday I hit up the trails for my 10 miler. I realized on my way there that I only had the bug repellent in my car that had been sitting there for a few years... and wasn't sure how good it was anymore. Last weekend I got eaten alive by mosquitos, and I wanted to make sure to bring repellent this time. I put on the old stuff anyway, hoping it was better than nothing, and it worked pretty well, thankfully. Only 1 bite this time, not 15 (and that's not a joke). I also realized I forgot to pack my Clif Shot Bloks and my Energybits - argh. I only had one in my backpack that was leftover from a previous run. While for most this might not be a big deal, who really needs chews for a 10 miler... well, I do. I also don't eat breakfast before running, so the chews and Energybits are the only things I'm taking to keep my hunger at bay and keep my energy levels up once I get to mile 5. I did have my bottle of Nuun and a bottle of water, both of which were gone by the end of my run. I felt good for the first 5 miles or so, and then fatigue started to kick in. My legs felt good, but I just wanted to be done. My pace slowed and I had to do a bit more walking than planned. I partially blame the elevation gain, but really I just think the week caught up with me. I went out later than I planned, and even though I was in bed at 10, I ended up sleeping until 8 the next morning. I was so tired, that I didn't feel guilty about it. I did a weigh in today for myself, to see how my week had been, and I was down a pound, so that was awesome to see (especially on a Sunday, when my weight is likely to be the worst after a weekend... maybe I should do weigh-in Fridays? What day do you think is best for weigh-ins?). Also, if you are interested, I wrote a recap for Terrapin 5k and a review of Everlast Nutrition Vegan Protein Powder (vanilla). AND if you are looking for a race, I've got some discounts for you. Head on over to the discounts page! I'm excited to see what my coach comes up with for this week's plan! Whoooo! How was your week? Did you race? Have a long run? Tell me about it! *Disclaimer: I received a free Sweat Tracker Performance Package to review as part of being a BibRave Pro. Learn more about becoming a BibRave Pro (ambassador), and check out BibRave.com to review, find, and write race reviews! I like to do weigh-ins on Wednesday, because it's right in the middle of the week, so if you had a rough weekend, you've had a chance to get back on track a bit and get a more balanced idea of where you are. I think that's a great way to do it! If recently switched to Wednesdays (though honestly I try to weigh-in every day, just because I like to have the data to look at. I don't freak out over the numbers, and use Wednesday number as my weekly check-in with myself). I'm glad to see i'm not the only one who doesn't eat breakfast before I run. I have learned now that I need to be eating protein bars or something to that effect immediately afterwards though. Yay! I'm not alone! It's definitely important to get something in there post-run. I like to eat the Clif Shot Bloks during, and if it's anything longer than 15 miles, I bring a Picky Bar or Clif Bar with me to eat around mile 12 or so. Post-run, I usually make myself a protein smoothie or drink chocolate milk with extra protein, which helps with muscle recovery. I'm also loving my experience so far with Sweat Tracker! It's great having a custom training plan and a coach to check in with!